Mama Anne Loarie couldn't find pants that fit well on her cloth diapered daughter. She began to fantasize about adorable jeans that were comfortable and could keep her daughter's bum warm. After unsuccessful searches, Anne decided to design her own line of organic jeans. 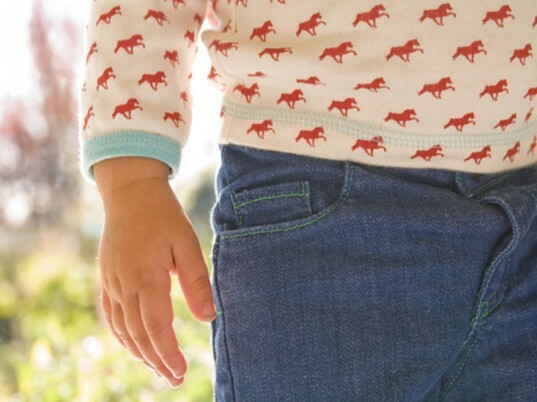 Made in the USA, Green Gamboni jeans come in 5 different styles and are all made out of 98% organic cotton and 2% elastic for babies on the move. Continue reading to see all of her cute styles. Some of Anne’s Italian family members found a special type of mushroom off the Mendocino Coast of California which is known as the porcini (or little pigs). Thinking that the mushrooms looked more like chubby legs than little pigs, Anne’s family aptly coined them gamboni (big legs). The Gamboni style jean is a basic 5-pocket jean. With an elastic back waistband, snap front closure and Gamboni green stitching. It comes in sizes 0-6 mo, 6-12 mo, 12-18 mo, 2T. The organic Candy Cap jeans are a dark vintage wash and sewn down back pockets. They come in sizes 0-6 mo, 6-12 mo, 12-18 mo, 2T. The Hedgehog organic jeans are meant for kiddos who stay close to the ground. 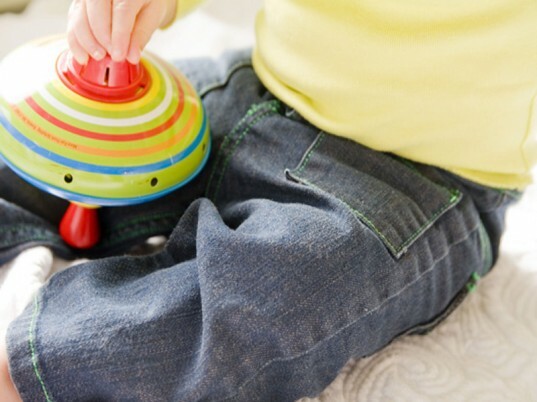 They have a reinforced knee which adds padding to the crawler and protection for tots unstable on their feet. They come in 0-6 mo, 6-12 mo, 12-18 mo, 2T. The Slippery Jack is an interpretation of the carpenter jean with a dark wash and Green Gamboni stitching. 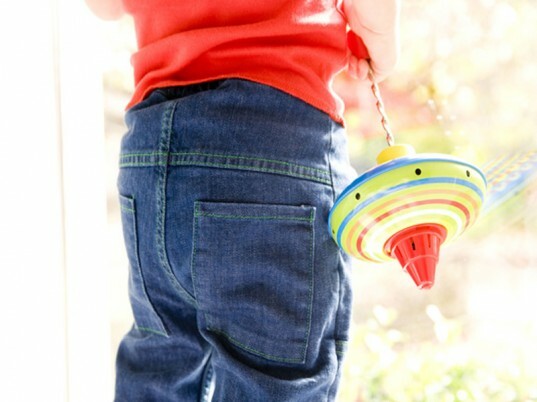 The organic jeans come in sizes 0-6 mo, 6-12 mo, 12-18 mo, 2T. The Coccora is a do-anything type of jean. The back pocket flap is sewn down to avoid dryer distortion and is finished with a dark wash. The Coccora comes in 0-6 mo, 6-12 mo, 12-18 mo, 2T. Some of Anne's Italian family members found a special type of mushroom off the Mendocino Coast of California which is known as the porcini (or little pigs). Thinking that the mushrooms looked more like chubby legs than little pigs, Anne's family aptly coined them gamboni (big legs). The Gamboni style jean is a basic 5-pocket jean. With an elastic back waistband, snap front closure and Gamboni green stitching. It comes in sizes 0-6 mo, 6-12 mo, 12-18 mo, 2T.